"Airbnb, You can't Hide, You Profit From Apartheid!" On Friday January 22, activists from CODEPINK Women for Peace, Jewish Voice for Peace-Bay Area, and other local groups gathered in front of the Airbnb headquarters in San Francisco to pressure the company to stop listing vacation rentals in illegal Israeli settlements. Around 40 people attended the rally holding signs and chanting such things as, “Airbnb, you can’t hide, you profit from apartheid!” and “Airbnb, take a stand, stop renting houses on stolen land!” Passersby to the protest and people from office building who were getting lunch responded positively to protesters and their requests that Airbnb adhere to international law. Airbnb is a website to connect people who want to find vacation rentals, and its listings include homes in 190 countries across the world. Unfortunately some of these rentals are homes in illegal Israeli settlements on stolen Palestinian land. These settlements are in violation of the Fourth Geneva Convention, which prohibits an occupying power from moving its civilian population onto the land it is occupying. There are approximately 650,000 Jewish settlers living in the West Bank and East Jerusalem, and settlement growth is rapidly increasing. Israeli settlements, which serve a Jewish-only population, are a clear form of state segregation. They confiscate Palestinian land, homes, and resources; severely restrict Palestinian freedom of movement; and prevent any possibility of a contiguous Palestinian state. By listing homes in Israeli settlements, and earning a 9-15% fee from hosts and guests, Airbnb is directly profiting from and promoting Israeli apartheid and land theft. This is not the only issue with Airbnb. There are concerns in San Francisco and many other cities about the effect Airbnb is having on reducing available affordable housing for permanent residents, especially in neighborhoods that are already struggling with the displacement of low income and communities of color through gentrification. 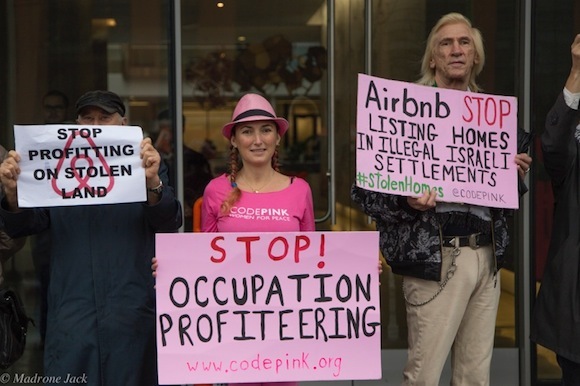 CODEPINK is part of a coalition of organizations, including American Muslims for Palestine, Jewish Voice for Peace, US Campaign to End the Israeli Occupation, and US Palestinian Community Network, that is asking Airbnb to stop listing homes in Israeli settlements. To sign the petition and learn more, go to stolenhomes.org. Ariel Gold is a CODEPINK staffer who works on our BDS campaigns; read her activist bio here. Fantastic work. Surely Airbnb is feeling the pressure to take remove listings in the illegal settlements. If not, I guess the pressure just has to grow!